Under the leadership of Donald J. Hall, son of J.C., who became president and CEO in 1966, Hallmark grew and expanded in many ways, introducing its quality products to global audiences. 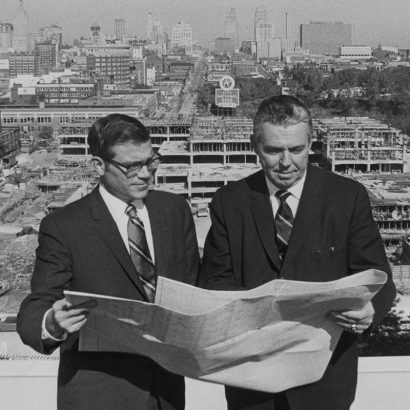 Pictured at right, then Hallmark CEO Don Hall (left) looks over plans for the new Crown Center development with the development’s architect, Ed Barnes. Starting in the late 1960s, the vision of J.C. and Don Hall led to the development of Crown Center on the land surrounding Hallmark’s headquarters in Kansas City, Mo. As an early example of urban revitalization, this project turned a blighted 85-acre section of the city into a thriving retail, residential, office and entertainment complex. During the 1970s, Hallmark Keepsake Ornaments were introduced, revolutionizing Christmas decorating and sparking the phenomenon of ornament collecting. To meet the needs of smaller card departments and retailers in the mass channel, Hallmark rolled out the Ambassador brand. The launch of the Shoebox Greetings line of humorous greeting cards was, at the time, the company’s single largest product line introduction. Mahogany cards were introduced for African-American consumers, and card lines for Jewish and Hispanic consumers soon followed. In 1986, the Hallmark Gold Crown® store program was formalized, bringing together a network of independently owned and operated retailers to build on the strength of the Hallmark brand and products.